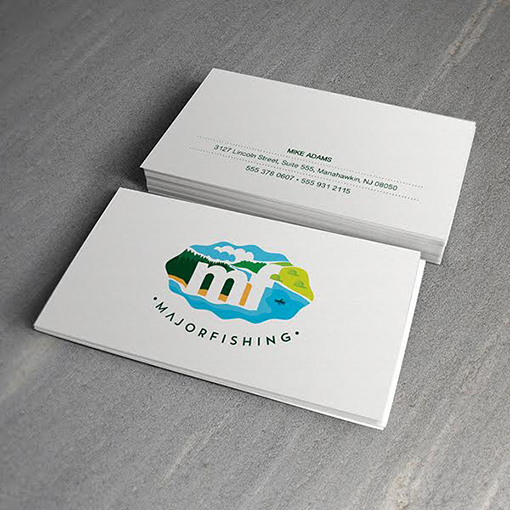 An illustrated logo gives this business card design for fishing guide company Major Fishing an artistic, creative look with an outdoorsy theme. The logo on the front side of the card features wavy edges and an oval shape to mimic the look of waves in water. A tiny fisherman canoes past the lowercase "mf" initials on the shore, helping recipients make the mental connection between the brand's name and its services. Four-color process printing gives the logo a unique style reminiscent of a watercolor, yet allows for sharp, crisp text that makes the contact information readable even at a small size.